Surely the best known protea, prized worldwide as a magnificent cut flower and in South Africa honoured as the national flower. Protea cynaroides is a woody shrub with thick stems and large dark green, glossy leaves. Most plants are one metre in height when mature, but may vary according to locality and habitat from 0.35 m to 2 metres in height. 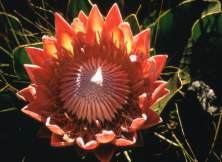 The "flowers" of Protea cynaroides are actually flower heads with a collection of flowers in the centre, surrounded by large colourful bracts. The flowerheads vary in size, from about 120 mm to 300 mm in diameter. Large, vigorous plants produce six to ten flower heads in one season, although some exceptional plants can produce up to forty flower heads on one plant. The colour of the bracts varies from a creamy white to a deep crimson, but the soft pale pink bracts with a silvery sheen are the most prized. Protea cynaroides has one of the widest distribution ranges of all the Proteaceae and occurs from the Cedarberg in the northwest to Grahamstown in the east. It occurs on all mountain ranges in this area, except for the dry interior ranges, and at all elevations, from sea level to 1500 meters high. The combination of the different climatic conditions with the large range of localities has resulted in a large variety of leaf- and flower sizes, as well as flower colours and flowering times. The different forms retain these characteristics even when grown under the same conditions on a commercial scale. This has made it possible to grow Protea cynaroides as a cut flower for a wide variety of export markets, where the flowers are needed at different times of the year. This South African protea is now grown in large quantities in New Zealand, Australia and Hawaii. In Mediterranean climates in Europe, America en Australia it can be grown successfully as a garden plant in the right type of soil. Protea cynaroides is part of an ancient plant family, the Proteaceae, which had already divided into two subfamilies before the break-up of the Gondwanaland continent about 140 million years ago. Both subfamilies, the Proteoideae and the Grevilleoideae, occur mainly in the southern hemisphere. 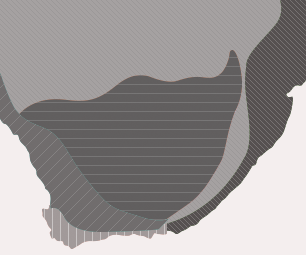 In southern Africa there are about 360 species, mainly from the subfamily Proteoideae, of which more than 330 species are confined to the Cape Foral Kingdom, between Nieuwoudtville in the northwest and Grahamstown in the east. Protea cynaroides belongs to the genus Protea, which has more than 92 species, subspecies and varieties. Other well-known genera of the Proteaceae are the Leucospermum with the brightly coloured "pincushion" flowers, Leucadendron with yellow or red-brown foliage and Serruria, of which the Serruria florida or "Blushing Bride" with its pale pink flowers is widely used in bridal bouquets. Plants in the subfamily Grevilleoideae occur mainly in Australia. The amazing variety in plant size, habit, flower size and colour of the genus Protea was the reason it was named after the Greek god Proteus, who could change his shape at will. The flower bud of Protea cynaroides looks remarkably like the globe artichoke vegetable with the Latin name of Cynara scolymus and this led the botanist Linnaeus to give it the species name cynaroides. Protea cynaroides can be propagated from seed or from cuttings. The stems have to be thick and strong to carry the heavy flower heads, this makes the taking of cuttings quite difficult, but good colour forms or cultivars have to be propagated from cuttings. Cuttings are made from semi-hardwood, 6-10 cm long, of the current season's growth. The cuttings are dipped for about four seconds in a rooting hormone solution and placed in a growing house with bottom heat (25ºC) and intermittent mist. The rooted cuttings are potted up when the roots are well developed and planted out in the late autumn in South Africa, or in spring in colder areas. The large nut-like seeds have to be treated during storage with a systemic fungicide with the active ingredient of metalaxyl (Apron) and sown from the middle of March, when the day temperature starts to drop. 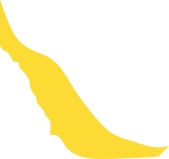 The seed is sown in open seedbeds, in a light, well drained soil and covered with a layer of sand (about 1 cm or 1 1/2 times the size of the seed). The bed is then covered with a grid against the attacks from birds and rodents. The seed will germinate three to four weeks after sowing. The plants are generally about four or five years old from seed before they flower. On older plants the side shoots tend to be quite short, so to encourage the development of new shoots and long stems, the stems bearing old flower heads should be cut back to ground level. Older plants also tend to become woody and should be cut back to ground level, where they will sprout again from the thick underground rootstock. Protea cynaroides occurs in fire prone vegetation, where natural fires occur every ten to thirty years. This 'Mediterranean' type of vegetation grows in soils with very low amounts of nutrients. These nutrients are used up by the plants during their lifetime and need to be returned to the soil to provide the food for a new generation of plants. 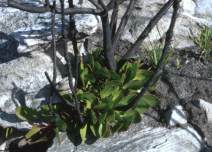 Protea cynaroides is adapted to survive the fires by its thick underground stem, which contains many dormant buds; these will produce the new growth after the fire. The flowers in the centre of the flower head open over a fairly long period of time, which makes it such a stunning sight in the garden for weeks at a time as well as a long lasting cut flower. The flowers are pollinated by Scarab Beetles and Protea Beetles and many other insects, as well as by birds. The birds are attracted by the nectar as well as by the insects visiting the flowers. The large flower heads produce a disappointingly small amount of good seeds, only 1 - 30 percent of flowers result in seed. The plant's need to produce nutrient-rich seeds in a nutrient-poor environment is thought to limit the amount of seeds it can produce. The seeds are quite large nuts, covered by hairs and stay in the old flower head for a year or more. They are released after a fire and dispersed by rodents and birds. Vogts, M. 1982. 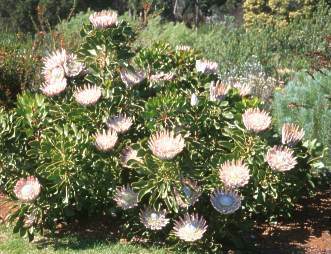 South African's Proteaceae: know them and grow them. Struik, Cape Town. Rebelo, T. 1995. Proteas, a field guide to the proteas of southern Africa . Fernwood Press, Cape Town.